The missing links: Are Ottawa's bike lanes reaching the people who need them? The missing links: Are Ottawa’s bike lanes reaching the people who need them? Gripping her handlebars as she swerves around potholes that riddle the road, forcing her to ride farther out into the street than she’s comfortable with, bike commuter Kathryn Hunt grits her teeth and steels herself for what lies ahead. With no bike lanes in sight, she counts the blocks until the Rideau Canal pathway. “I was nearly creamed by a bus this morning,” she says. 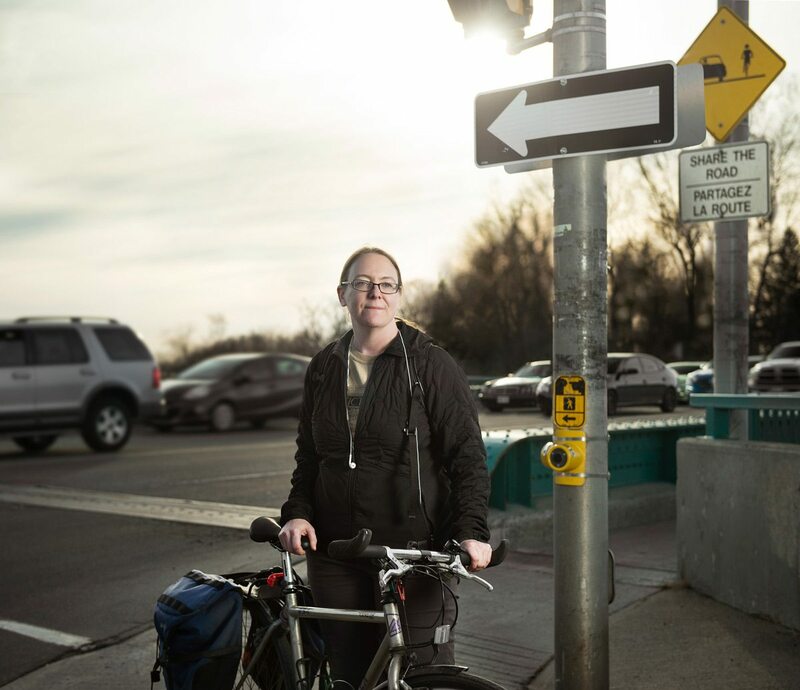 Every day, Hunt bikes along Heron Road and over Billings Bridge to get to her job downtown. Cycling has historically been an inexpensive mode of transportation for people, and it remains an attractive alternative for those who cannot afford a car or a bus pass. In Heron Gate, residents face a challenge that is common in such neighbourhoods: there are no bike lanes that connect it with the rest of the city. From Vanier to Bayshore, cyclists in the city’s low-income areas are forced to brave busy streets. Meanwhile, dedicated bike paths have been paved and painted to protect bike commuters in more affluent areas such as the Glebe and Westboro. It’s a pattern researchers have uncovered in other cities as well: people in low-income communities are more likely to use bikes as part of their daily routine, but wealthier communities receive the lion’s share of funding. As the phenomenon becomes clear, a new term is being coined: cycling equity. While tough to define, it can be seen as fair distribution of resources, taking into account current situations and future needs. But those at the forefront of the push for cycling equity are saying that what’s really needed are voices from marginalized communities, who know best how to connect their neighbourhoods with the rest of the city. Here in Ottawa, the 2017 budget includes more than $8 million for cycling spending, adding 38 kilometres of bike lanes throughout the city. But as councillors and advocacy groups vie for funding, cyclists like Hunt are wondering whether or not the infrastructure will reach the communities that need it most. While research on cycling equity in Canada is limited, the U.S.-based Alliance for Biking and Walking reported in 2015 that lower-income Americans are about twice as likely as their wealthier counterparts to bike for transportation (rather than leisure). “Bicycling can be a great transportation solution for people,” says Adonia Lugo, an urban anthropologist in Los Angeles who has spent much of her career studying the relationship between cycling and other demographics, such as race and income. “If they don’t have enough money to be riding the bus every day, that’s where the bicycle comes in in some people’s lives — as this absolute last resort.” Lugo says cities are not built for people who bike out of necessity, but rather for people who choose to bike for leisure. That seems to be the case in Ottawa, where the city — up until recently — has been largely relying on the NCC’s network of multi-use paths, designed to enjoy views of the city’s waterways, to provide safe cycling corridors for bike commuters. Looking to the west end, Haché points to neighbourhoods such as Bayshore and Bells Corners as areas with significant numbers of low-income earners and poor walkability and therefore in urgent need of cycling infrastructure. But where bike lanes are being planned — such as along Richmond Road, connecting Bayshore and Bells Corners to the existing network — construction will not begin until at least 2020. Things are looking better in Vanier. In March, the city announced that McArthur Avenue, a major east-west corridor for Vanier residents, will be getting a bike lane in 2017. Rideau-Vanier councillor Mathieu Fleury, who is a member of the city’s transportation committee, says Montreal Road will receive “full revitalization” in 2018, suggesting bike lanes are part of the plan for the busy arterial road. It’s a good start. Poor road conditions in Vanier and having to share thoroughfares with busy traffic make it a dangerous area for cyclists. Still, more than twice as many people in Vanier bike to work than the city average, according to the 2014 Ottawa Neighbourhood Study. The same study also found that about twice as many people in the neighbourhood, compared with the city-wide average, are low-income. “You do see a lot of cyclists in the neighbourhood,” says Sarah Partridge, a cycling advocate who lives in Vanier. “Cycling is cheap, and you can generally do everything you need to do nearby on a bike.” She says that the high cost of bus fare and the lack of Transitway stops in Vanier means biking is one of the few ways to get around the neighbourhood. Despite what statistics and anecdotes suggest, factors such as income are not taken into account when developing new cycling projects in Ottawa, says Zlatko Krstulic, a City of Ottawa transportation planner. 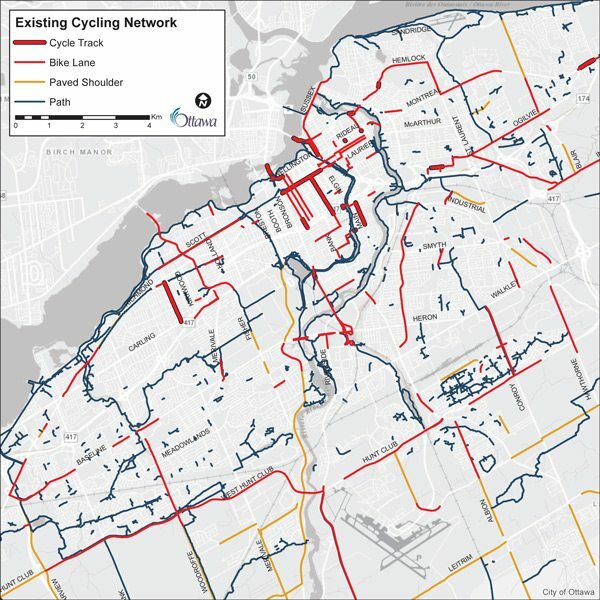 Although he acknowledges that improving cycling infrastructure will make life easier for residents who cannot afford to own a car, Ottawa’s focus is on connecting the city’s neighbourhoods by expanding its crosstown bikeways. “When we put these routes together, we’re looking at the whole city. We’re not bending it one way or the other for any other reason than connectivity,” Krstulic says. Fleury, who has been involved in cycling projects on Beechwood and Deschamps avenues as well the Adàwe Crossing over the Rideau River, confirms that income is not taken into account when infrastructure in his community is planned. Rather, his priority is making the road networks safe. While no one is arguing against safety, it is difficult to prioritize neighhourhoods when planners aren’t hearing from residents. Lugo’s work in urban studies shows that advocacy groups such as the Alliance for Biking and Walking need more people of diverse backgrounds. “We don’t have as much diversity in the bike movement as there is diversity in who’s riding bicycles,” she explains, adding that this homogeneity contributes to improvements that reflect one group’s needs over another’s. The inequitable distribution of cycling facilities is an issue in cities across North America. In 2016, McGill University researcher Elizabeth Flanagan conducted a study of cycling equity in Chicago, where she found that bike lanes were less likely to be found in low-income areas. “Most of the facilities were in the north end of Chicago, where it’s a predominantly white population and more wealthy,” she says. While the group does not address equity in its work, Citizens for Safe Cycling vice-president Heather Shearer says that it has a low-income membership rate and their meetings are open to everyone. But not everyone is able to get to those meetings. As Haché points, out, if bus fare — or a babysitter — is not in the budget, participation in a city-led consultation or an open house about a new road improvement project might not be an option, and your voice is unlikely to be heard. In fact, this work has begun to pay off. In April, the city reached out to Heron Gate residents concerning plans to create a bike lane along a short strip — less than one kilometre — of Heron Road. This will certainly make the trip along Heron Road better, says Haché. But he adds that because the lane will cover only a small portion of the strip, it doesn’t make longer commutes much safer, and moreover, it creates yet another bike lane that isn’t directly connected to other bike lanes or bike paths. In effect, it creates a missing link — just one of many, Haché points out, that plague Ottawa’s cycling infrastructure. her work with Haché at the Healthy Transportation Coalition for cycling improvements to the neighbourhood. “You’re automatically going to fight for infrastructure where you live,” she says.